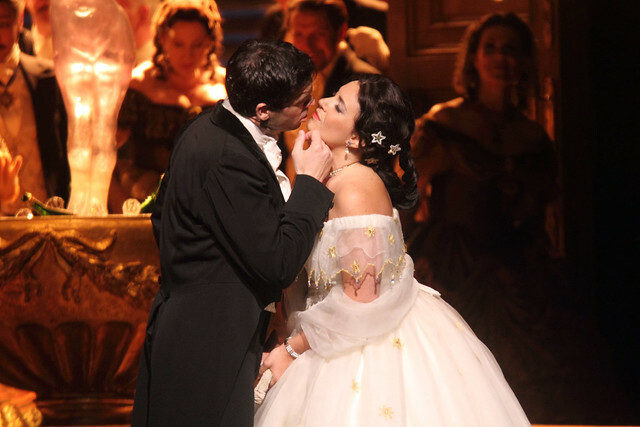 The Bulgarian soprano returns to the Royal Opera House to reprise her remarkable performances in La traviata. Earlier in the month I had the privilege of being in the audience for Sonya Yoncheva’s Royal Opera House role debut as Violetta Valéry in La traviata. I have not seen so remarkable a performance of the role since Angela Gheorghiu appeared as Violetta on the first night of this classic production more than twenty years ago. Sonya was born in Bulgaria, and in 2010 won the Plácido Domingo Operalia competition. For The Royal Opera she has since sung Musetta in La bohéme, and replaced Anna Netrebko as Marguerite in Faust last year. Among many other engagements around the world, she sang a remarkable Mimì in La bohéme for the Metropolitan Opera, New York, at very short notice earlier this year. The New York Times stated that ‘Miss Yoncheva seems an artist on the brink of a major career’. Sonya has been winning acclaim for her appearances around the world and is now under contract with Sony Classical. A new album of selected arias titled Paris, mon amour showcases her versatility. It is now available in the ROH Shop, in person and online; Friends of Covent Garden benefit from a 10% discount. We now have five performances coming up with Sonya Yoncheva as Violetta and two are already sold out – so make sure you don’t miss out! The production is generously supported by Rolex and is given with generous philanthropic support from Dr and Mrs Michael West. Ms. Yoncheva is one of the most exciting singers of our time. Her interpretation of Violetta in La Traviata is nothing short of spectacular. I am glad I managed to be in the audience for her Covent Garden debut in that role. Equally her performance at the Life re-imagined Gala earlier this year was superb, particularly the aria from La Wally. I'll be back for another La Traviata in this run and will see two performances of Carmen with Ms Yoncheva as Micaela next season. I sincerely hope that the Royal Opera has plans to bring Ms Yoncheva back many more times in the very near future. Yoncheva has a glorious, vibrant, almost fluttery soprano which is absolutely perfect for Violetta, and she uses it with wonderful control - I've never heard sections of the role sung more accurately. Her performance absolutely justified claims that she is the most exciting thing in opera since Anna Netrebko first emerged, but I now wish she would take the opportunity to work on the role with a truly great Verdi conductor to deepen her characterisation. Although good, at the moment I feel her interpretation lacks a bit of abandon - it's almost too controlled, and she could use the text with far more incision. I don't think Minkowski should be conducting this opera in future, since it was extremely four square and plodding in his hands. It was a pleasure to encounter Franco Vassallo and Ismael Jordi once again showed himself to have a fine, if somewhat limited instrument. Please bring back Yoncheva as Violetta soon, but with Pappano in the pit and some truly fabulous colleagues alongside so that we can enjoy the best Violetta of her generation in her best form! What a fantastic introduction to opera on Saturday 27th June, Sonya Yoncheva was spell binding and totally enchanted me with her performance. I was left wanting more of her beautiful voice. Amazing night.